I would love to win this for my Grandpa. He just found out he has cancer again and it is at stage 4. The Dr's say there's not a lot they can do for it this time (he's had it before & did chemo) But we're keeping faith that he will be healed. this is very nice I would love to have this to give to my daughter as she loves to say the before dinner prayer and I think this would help her with saying her before bed prayers. I have never been religious in my life until recently I started doing some searching. And something in this cross looks like it would be very calm and meaningful. I would like to win this to give to my friends daughter for her Communion day. I visit the nursing home and I would like to give one to a resident there. I really like the overall concept of this and would like it for my teenage daughter to remind her of her relationship with God. Thanks. I would like to win this for my mother. She would love and treasure it. I'm facing some surgery in the next few weeks. 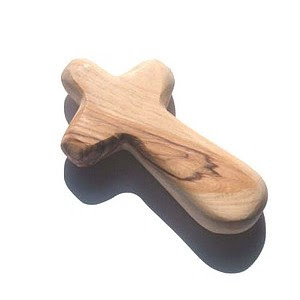 This cross would be perfect for me to give my daughters to help them keep the faith. My fiance lost his twin boys, it'll be two years this April and I know he's still strugging with it, I'd love to win this for him. I would love to win this for my grandma. I'd like to win this to give to my young daughter. I would like to win this for my father in law. Thanks for the chance. Oh yeah, duh, because he is a great man of faith but very hard to buy for. Lol. And now we're friends on FB. lOl. You just accepted my friend request. Thanks. I would love to win this for my husband we have recently been having some struggles with his heath and this would a nice gift. I would love to win because I have a "cross wall" where I hang crosses and this one is gorgeous!